In California and across the nation, cities are reclaiming their rivers to create vital recreational and gathering spaces. The Ventura River, one of the last self-sustaining rivers in Southern California, sustains one of the greatest diversities of plants and animals in the region. Since the first settlers arrived at its banks, the river has been an invaluable water source and gathering place for people. But today many residents and visitors are hardly aware the river exists. Incompatible land uses, especially along the river’s lower reaches, have created a visual and physical barrier, rendering the river largely invisible. People have few places where they can access and enjoy it. A coalition of local groups, state agencies, and a national conservation organization are working together to reclaim the river and reconnect the community to its greatest resource. 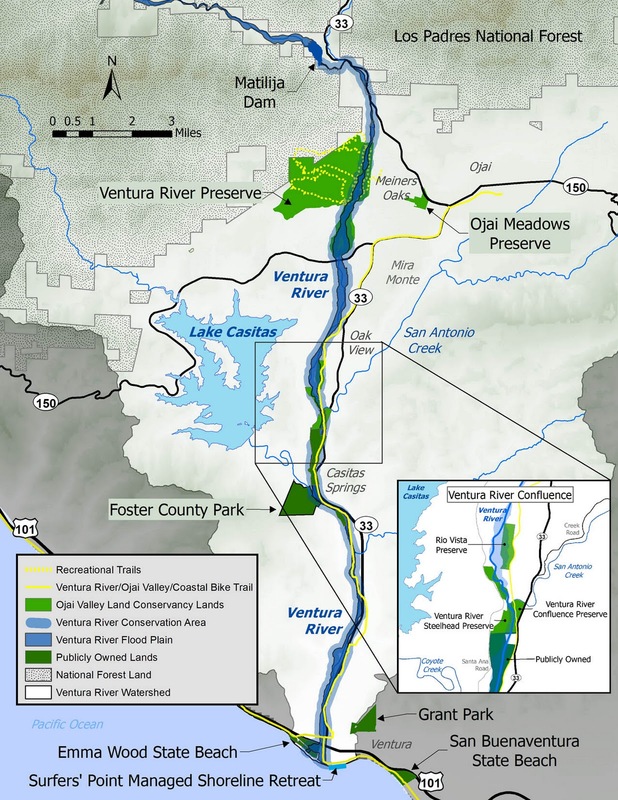 Their vision—The Ventura River Parkway—would create a continuous network of parks, trails and natural areas along the lower 16 miles of the river from Ojai to the estuary. Not only will the plan preserve this historic waterway, it will do so much more: protect water quality, conserve streamside and aquatic habitat, and restore sensitive floodplains. It will link neighborhoods to nature, and enhance our sense of place. Now is the time to rediscover this valuable resource, to nurture public awareness and appreciation for the river, and offer more of the river’s benefits to the people, communities and businesses along its banks.